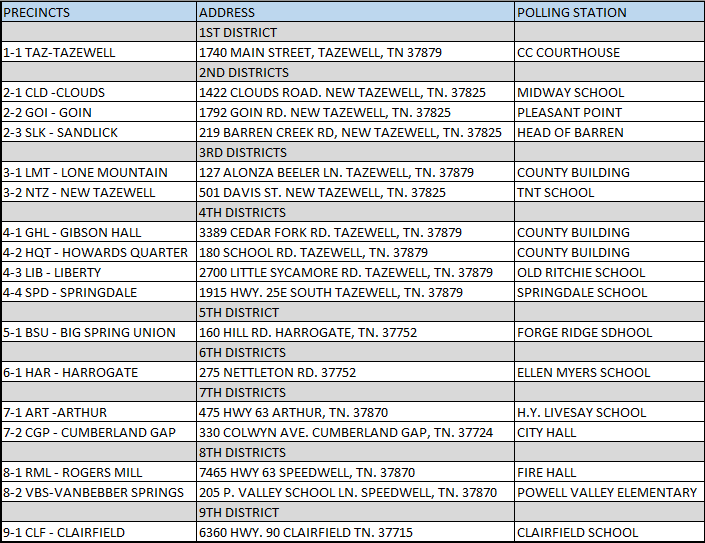 CLAIBORNE COUNTY WILL HOLD A COUNTY GENERAL ELECTION AND A STATE PRIMARY ELECTION ON AUGUST 4, 2016. QUALIFYING PETITIONS MAY NOW BE PICKED UP FOR THESE OFFICES. QUALIFYING DEADLINE FOR AUGUST 4, 2016 ELECTION IS NOON APRIL 7, 2016. QUALIFYING DEADLINE WITH THE STATE HIGHWAY OFFICIALS BOARD FOR THOSE RUNNING FOR THE OFFICE OF SUPERINTENDENT OF ROADS IS MARCH 24, 2016. MAY 6, 2016 IS THE FIRST DAY SOMEONE WHO WISHES TO VOTE ABSENTEE BALLOT BY MAIL MAY REQUEST AN ABSENT BALLOT. Our office is located at 1802 Main Street in Tazewell. We are open from 8:30am until 4:30pm Monday through Friday. We are closed for all county and state holidays. Federal or TN State government issued photo ID is now required to vote, unless an exception applies. College student IDs will not be accepted. To learn more about the new law and its exceptions, please call the Claiborne County Election Commission Office at 423-626-5128 or visit GoVoteTN.com.